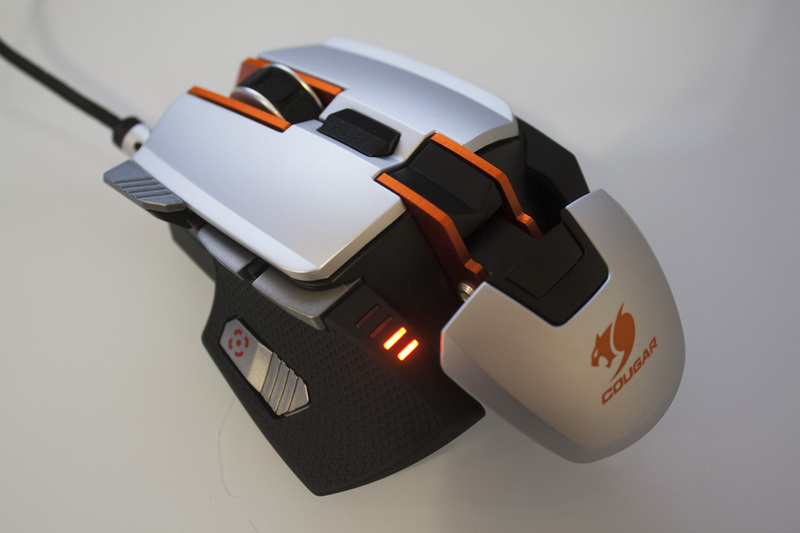 Today I’m looking at one of the most gorgeous gaming mice I’ve ever seen: the Cougar 700M. The brand is new to me, so I’m keen to see whether this adjustable gaming mouse makes good on its favourable first impression. Cougar provide a comprehensive list of specifications, so I’ll reproduce it here. Of note is the high DPI laser sensor (8200), aluminium construction, 8 programmable buttons and on-board processor / memory. The 700M is presented in a rather well-constructed box, with a clear plastic façade at the top and cardboard beneath. The box lists the mouse’s specifications on the bottom, with additional photos and details on the sides. The box comes apart in a pleasing diagonal split, with the plastic window lifted off. Beneath the mouse platform, there are a few extras – an instruction manual, weights and a replacement interchangeable palm rest. 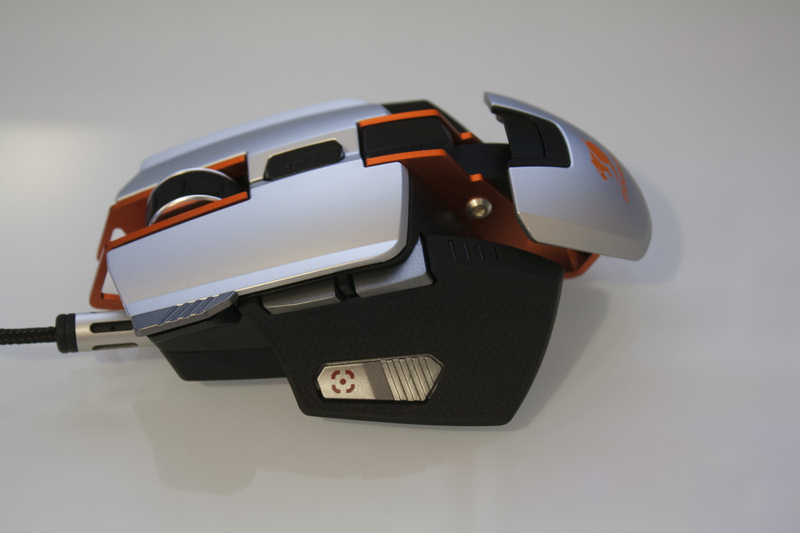 The mouse is one of the most handsome I’ve seen, with a solid-feeling aluminium and plastic construction rendered in silver, black and orange. The mouse has a very angular appearance, with plenty of fins and offshoots that set it apart from the usual smooth and streamlined mouse design. Despite this, the mouse is actually quite comfortable – the buttons, palm rest and side grips have all been contoured to fit the human hand. A hexagonal soft touch material is used for these side grips, while the rest of the mouse’s surface is largely smooth plastic. The left and right mouse buttons used here are quite long, with the button actuating from about one third of the way down. An additional ‘fin’ button sits on the top left hand side, with a lined texture differentiating it from the left mouse button. Between the primary buttons we have a scroll wheel, with a large tread and a clicky scrolling action. 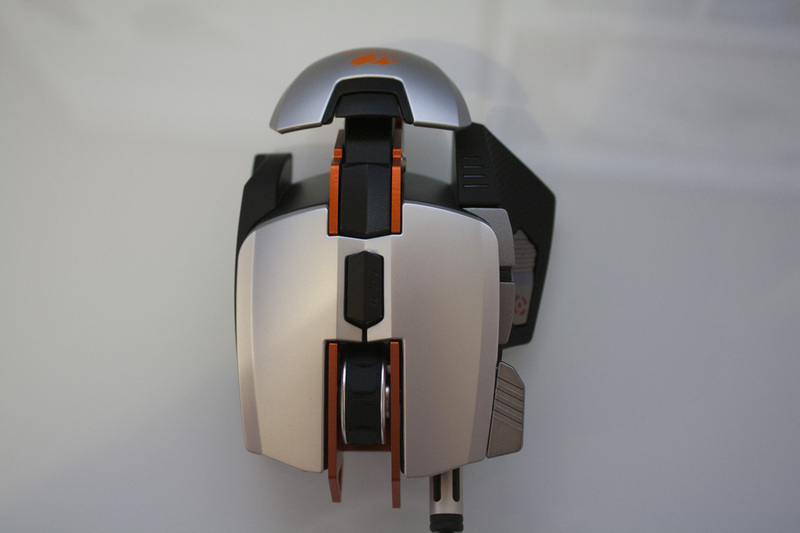 The scroll wheel and buttons are separated by an orange metal structure, which extends past the front of the mouse to create a leading edge. A DPI button sits beneath the scroll wheel, its placement making it easy to adjust and hard to press accidentally. 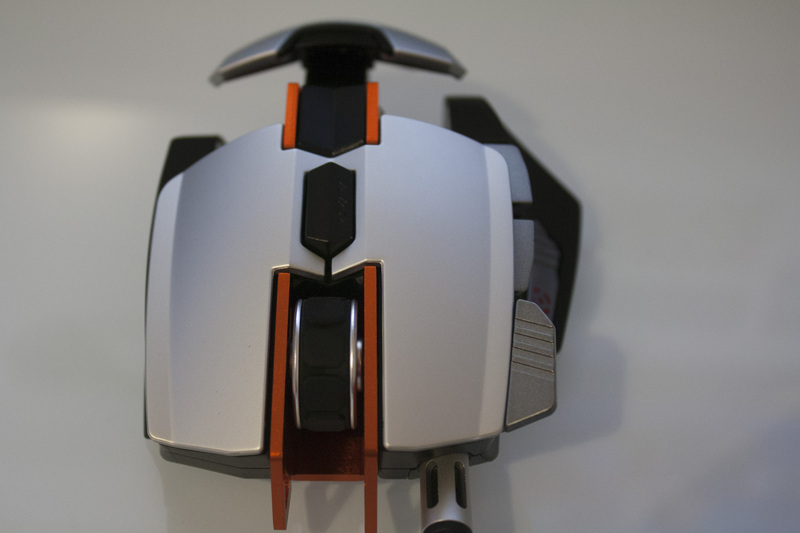 The current DPI level is reflected in four orange LED indicators on the left side of the mouse. Beneath the DPI button, we have a small piece of black plastic, again flanked by orange aluminium. The piece can be tugged upwards, revealing a cartridge for up to four 4.5g weights. 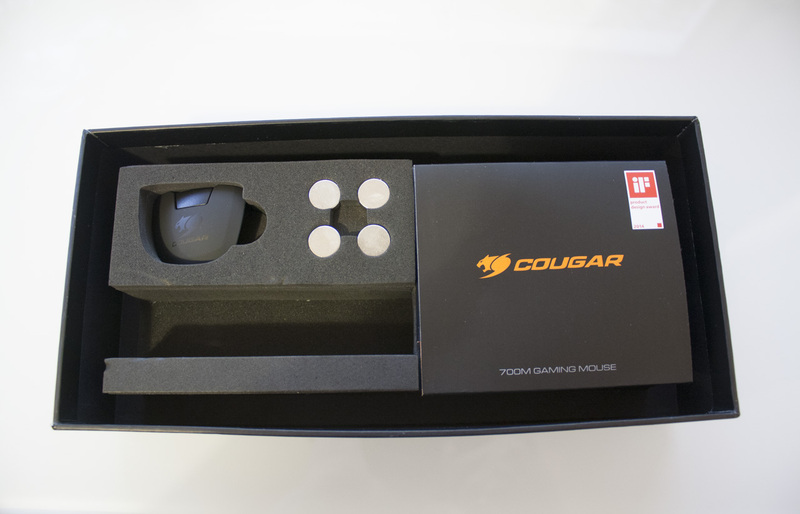 The palm rest sits at the near end of the mouse, rendered in the same silver plastic as the mouse buttons with an orange Cougar logo. A small tab can be pushed down here, allowing the palm rest to be removed and replaced with a smaller ‘sport’ version. 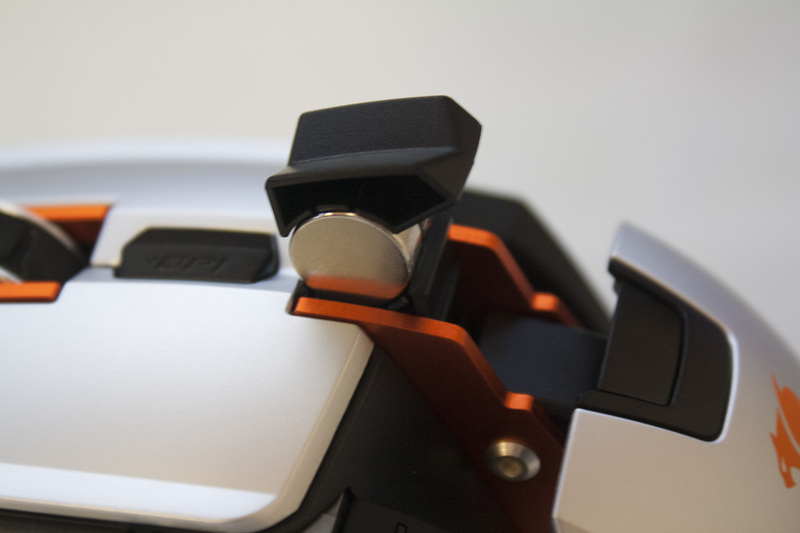 The palm rest’s angle can also be adjusted via a tool-less knob below, allowing the mouse to suit palm or claw grips. The left side of the mouse includes the majority of the extra buttons. Two thumb buttons are tucked into the centre portion of the left side, mapped to ‘forward’ and ‘back’ by default. Below these, a ‘sniper’ button rests at a 45 degree angle. This button can do anything, but is intended to lower your DPI on the fly, allowing you to make fine adjustments while using a sniper rifle or another scoped weapon in a shooter. The right hand side has no buttons, just the hexagonal textured soft-touch grip. 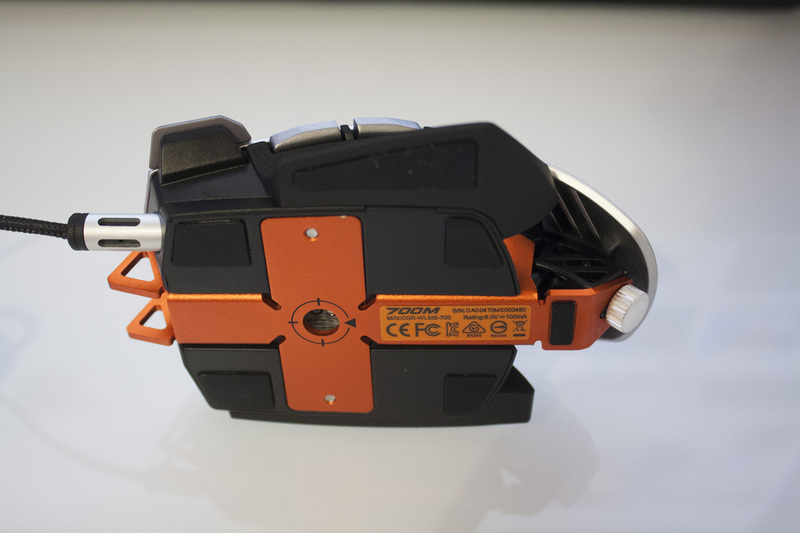 Looking now at the bottom of the mouse, we see the same orange aluminium structure. In the centre of this we have the 8200 DPI laser sensor, and some regulatory information. Square mouse feet lie in four corners of the main body, with two additional feet for the left-side grip and below the palm rest. An LED lies beneath the scroll wheel, producing a light that is invisible to the user, but somewhat visible to those sitting across the table. 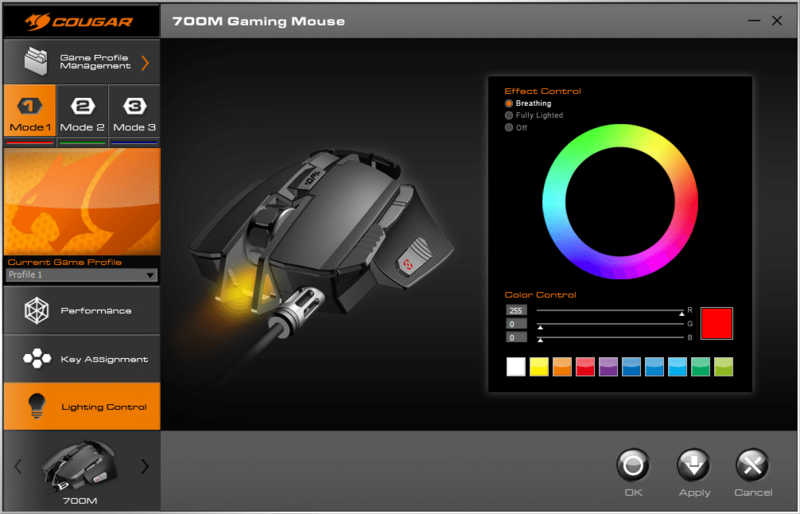 The LED’s colour can be freely chosen in the mouse’s software (which we’ll look at later). The final aspect of the mouse is its cable, which includes a gold-plated USB tip and a unique ‘muzzle break’ where the cable meets the mouse. The muzzle break is intended to prevent any fraying of the cable at this point, and also serves in a similar manner as a mouse bungee, preventing the cable from getting tangled. The mouse is available in two colours – the silver, as shown in the previous photos, and this black alternative which looks equally fetching. 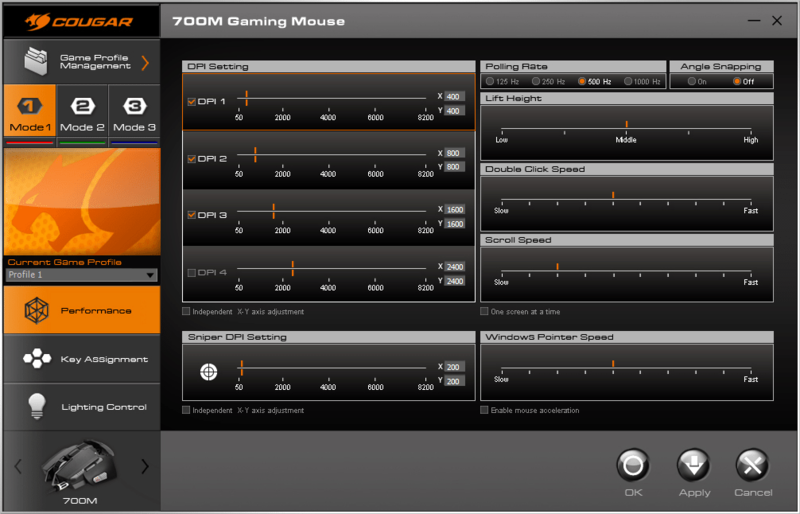 The Cougar 700M comes with ‘UIX’ software, which provides closer control over the 700M’s DPI, polling rate, click speeds and other settings. 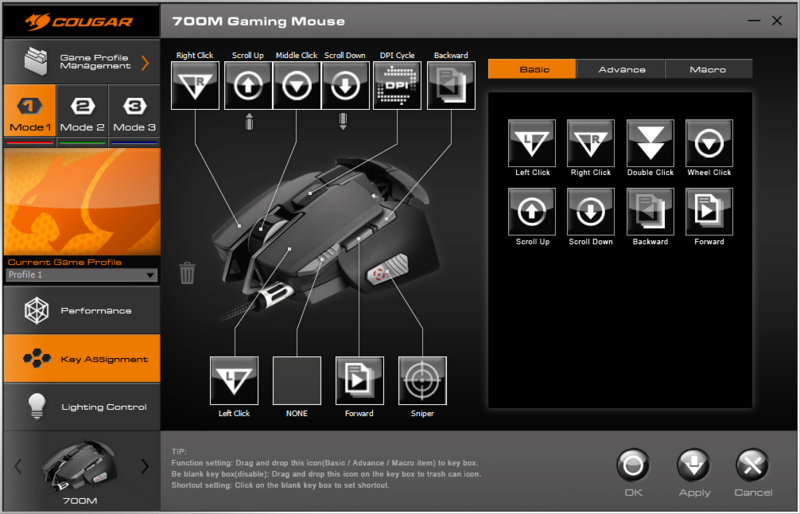 The second pane is intended to allow the mouse’s buttons to be re-programmed to different functions or software macros. The interface is quite straight-forward. The software also allows the front-facing LED to be changed to a different colour. A breathing effect can also be applied. In order to give this mouse a fair shake, I used it as my primary mouse for both desktop and laptop for a period of about three weeks. In that time, it was used for work – writing, editing, Photoshop – and games. The primary game I played was Counter-Strike: Global Offensive, but I also tried Wasteland 2, Heroes of the Storm, Civilization V and StarCraft II. From the outset, the 700M feels great. It fits well in my hand, with the buttons well positioned and providing nice clicky feedback. The scroll wheel is nice too, with a satisfying muted roll. 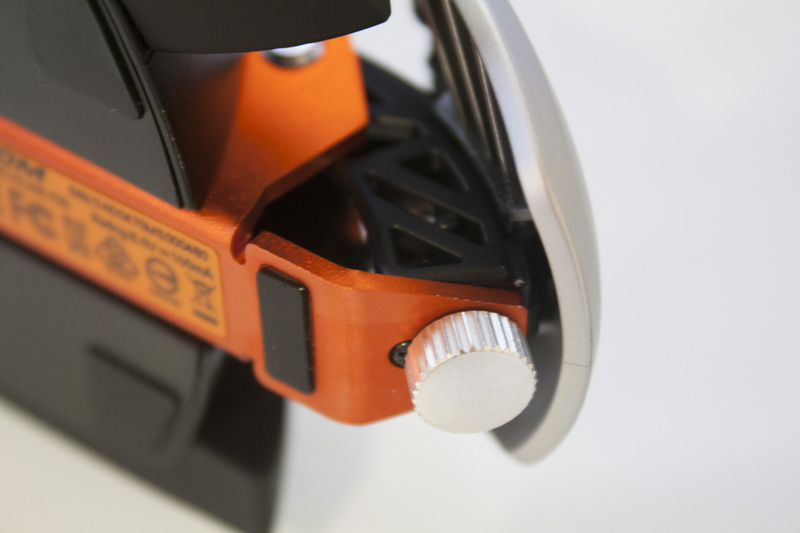 The adjustable weights are a bit hard to access, but slamming the cartridge back into the body of the mouse feels like loading a fresh magazine into a rifle; cool. I even find a use for the DPI-lowering sniper button outside a game, for making fine motions in Photoshop. Everything is gravy. However, all of that changes when I boot up Counter-Strike: Global Offensive. This shooter requires pinpoint accuracy, and is in many ways the ultimate test of a gaming mouse. And for whatever reason, I just don’t get as good results with the 700M as I do with other mice. 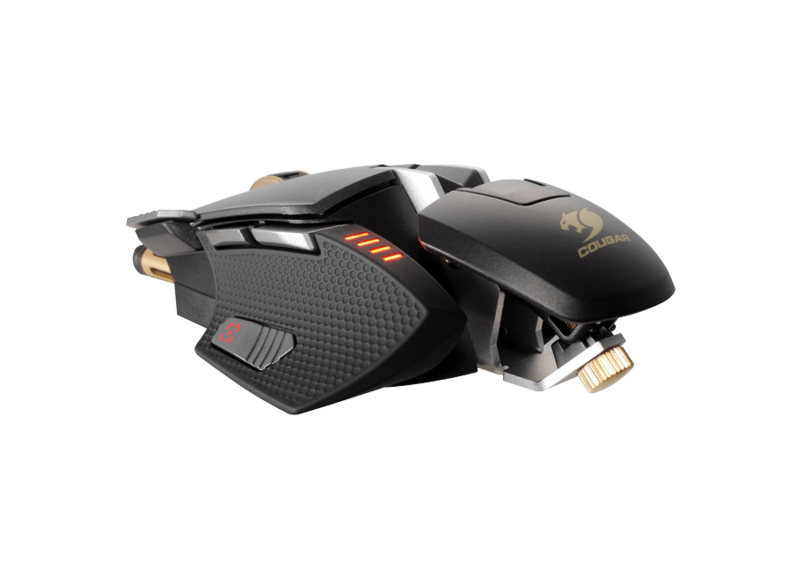 The mouse feels inaccurate in my hand; the placed shots, short bursts and carefully controlled sprays that are vital to success in Counter-Strike feel harder to pull off. The 700M feels better after some adjustments – removing the weights and their magazine, installing the ‘sport’ palm grip – but it remains a little harder to control than my previous mouse even when it weighs the same and is set to the same sensitivity. This doesn’t feel like an issue with the sensor or the software, which makes me think it is just down to the overall shape of the mouse. It just doesn’t seem to fit my grip, for whatever reason. In other games, this lack of accuracy was less of an issue. Civilization is quite sedate and the mouse was good enough here. Wasteland 2 and Heroes of the Storm seemed to work well enough too, although in StarCraft I felt echoes of this same inaccuracy once the game got hectic. Ultimately, the 700M will divide users. I’ve invited a few others to try it, and many love it – but others, like me, feel that it’s a bit clumsy in some games. Your mileage may vary. I really like the 700M – the button placement, the build quality and the overall look of the mouse is fantastic. For day-to-day use and in many games, it’s the best mouse I’ve ever used… but for others, like Counter-Strike, it feels a little off to me. Ultimately, I still want to recommend the 700M – it is too gorgeous, too replete with functionality to dismiss. Just remember that its angular lines and metal chassis may not suit everyone. I’ll continue using the mouse in Counter-Strike and other games, and I’ll update this review if I’m able to solve these issues with a change in drivers, settings or other factors. As I said – this mouse is worth the effort. Can u update us on the counter-strike usage with the mouse thus far?